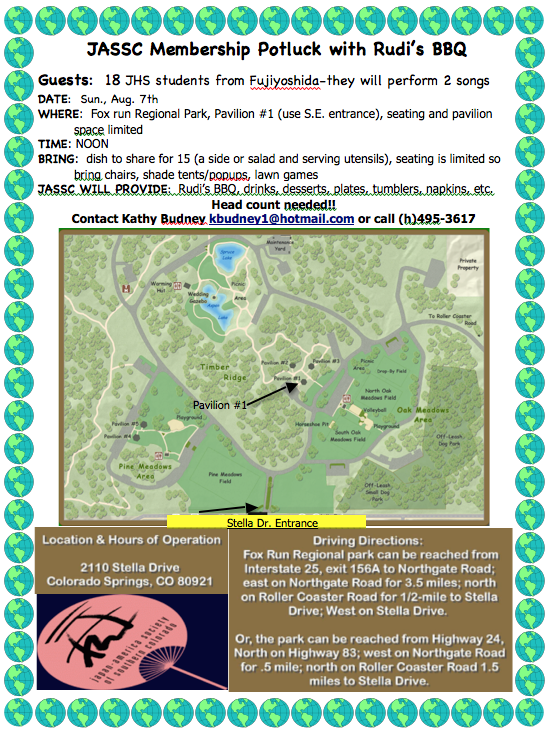 The Annual JASSC Membership Potluck will be held at noon on Sunday, August 7th at Fox Run Regional Park - Pavilion #1. Signs will be posted to guide you from the Stella Drive entrance (southeast entrance). The Entree (Rudy's BBQ! ), Drinks, Desserts, plates, and utensils will be provided. Please bring a side and/or salad (along with serving utensils) for everyone to share. As a rule of thumb, please prepare at least 15 servings. Seating and pavilion space will be limited - so bring your lawn chairs, outdoor games, shade tents, etc.. The 18-member JHS student group from Fujiyoshida (and their host families) will be in attendance again this year. As a special treat, they will perform two songs for our membership! Please join us for this great occasion. I look forward to seeing you and your families! Please contact Kathy Budney with questions. We need a head count for our Rudi's order. Please contact Kathy Budney at kbudney1@hotmail.com or call (h)495-3617.